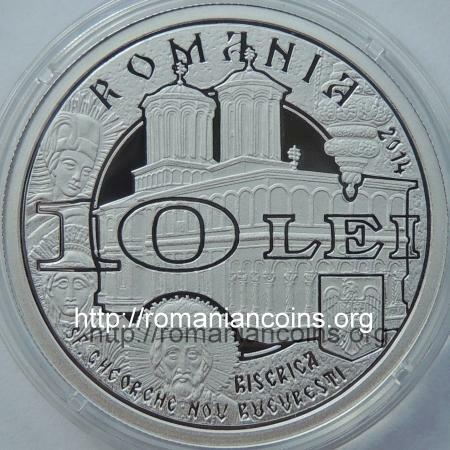 Obverse: ROMANIA, year 2014, face value 10 LEI, coat of arms of Romania, Saint George the New church in Bucharest, to the left fragments from three icons of Saint George, Saint Paraschiva and Saint Nicholas (the church being consecrated to these saints), to the right the lamp above the grave of Constantin Brâncoveanu (buried inside the church), inscription "BISERICA SF. GHEORGHE NOU BUCURESTI" meaning "SAINT GEORGE THE NEW CHURCH BUCHAREST" Reverse: fragments from the votive painting of the Saint George the New Church in Bucharest, with the faces of the Holy Brâncoveni Martyrs, year of the martyrdom 1714, inscriptions SF. RADU [ST. RADU] SF. STEFAN [ST. STEPHEN] SF. CONSTANTIN [ST. CONSTANTINE] SFETNICUL IANACHE [COUNCILOR IANACHE] SF. MATEI [ST. MATTHEW] and SF. 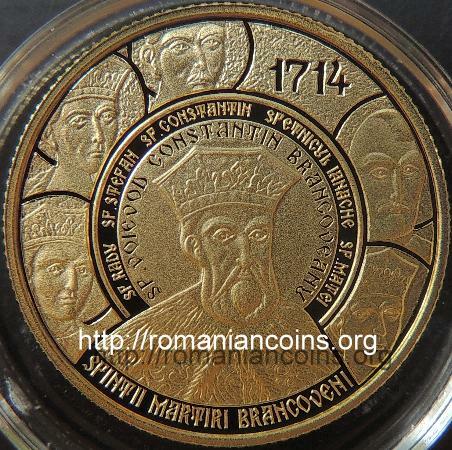 VOIEVOD CONSTANTIN BRANCOVEANU [ST. VOIVOD CONSTANTINE BRANCOVEANU], in exergue inscription "SFINTII MARTIRI BRANCOVENI" meaning "MARTYR SAINTS BRANCOVENI"
Obverse: ROMANIA, year 2014, face value 100 LEI, coat of arms of Romania, Saint George the New church in Bucharest, to the left fragments from three icons of Saint George, Saint Paraschiva and Saint Nicholas (the church being consecrated to these saints), to the right the lamp above the grave of Constantin Brâncoveanu (buried inside the church), inscription "BISERICA SF. 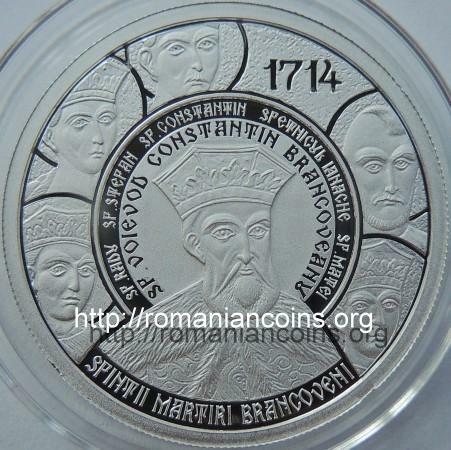 GHEORGHE NOU BUCURESTI" meaning "SAINT GEORGE THE NEW CHURCH BUCHAREST" Reverse: fragments from the votive painting of the Saint George the New Church in Bucharest, with the faces of the Holy Brâncoveni Martyrs, year of the martyrdom 1714, inscriptions SF. RADU [ST. RADU] SF. STEFAN [ST. STEPHEN] SF. CONSTANTIN [ST. CONSTANTINE] SFETNICUL IANACHE [COUNCILOR IANACHE] SF. MATEI [ST. MATTHEW] and SF. VOIEVOD CONSTANTIN BRANCOVEANU [ST. VOIVOD CONSTANTINE BRANCOVEANU], in exergue inscription "SFINTII MARTIRI BRANCOVENI" meaning "MARTYR SAINTS BRANCOVENI"
The central ring diplays Saint George the New Church in Bucharest, the last foundation of Constantin Brânconveanu (1707), raised on the location of an older church. 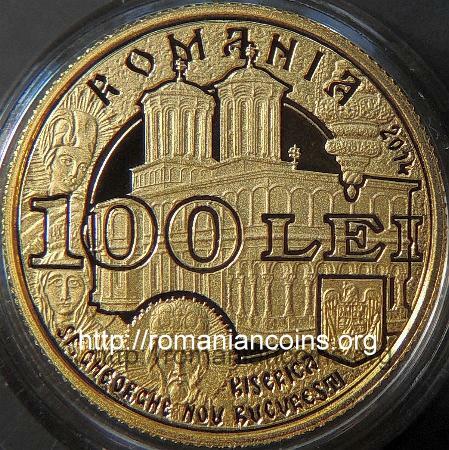 Inside its yard the Kilometre Zero of the capital and as such of Romania is placed. According to prince's personal chronicler, Radu Greceanu: "His Majesty could not bear in the middle of the borough, with so many people, such a church..." "small and dark and not matching the inn, which around it lays", "as a merciful and lover to make alms, well intendedly from foundation having it wrecked, have raised a large and wonderful and beautiful monastery". The before-standing church was "very old, built by a boyar namely Dobruş the Ban" . The name of the architect is known - Veseleil, supervisor being the great aga Ianache (Enache) Văcărescu, and head painter - Pîrvu Mutu . Right after the public execution of prince Constantin Brâncoveanu, of his sons Radu, Ştefan, Constantin and Matei and of councilor Ianache, their bodies were dragged on the streets of Constantinople and thrown into the sea. The heads, borne on top of spears, were exposed at the entry of the saray, toward the evening being also thrown into the sea . Fished back by christian fishermen, the bodies were laid to rest in the monastery on the isle of Halki, isle with Greek population . The monastery had received financial support in 1702 from Brâncoveanu, thus being possible to explain this destination. Brâncoveanu's wife, grandsons, daughters and sons in law were in prison at the time, also in Constantinople, with their fates undecided. In this Greek monastery lay the earthly remains of the Brâncoveni over to 1720, when lady Maria managed to covertly repatriate them. The Monastery of Hurezi in Oltenia, also a foundation of Constantin Brîncoveanu (1692), had been prepared as burial place for himself and for his family. Despite this, as Oltenia was under Austrian occupation, de facto since 1716, lady Maria would settle with Saint George the New Church in Bucharest, where she buried her husband under an anonymous gravestone, adorned in "Brâncovenesc" style and bearing the coat of arms of Walachia. This anonymity, according to , was on purpose. The intention was to prevent too much attention to be drawn, as sultan Ahmed III, the same who had condemned the prince to death, was still on the imperial throne. The grave, up to now lying inside the church, can be identified by the silver lamp above it, inscribed with discreet letters: "+ This lamp which has been given at St George the New lights where the bones of the blissful prince Io Costandin Brâncoveanu Basarab Voievod rest and is made by the lady of his majesty Mary, who her majesty also hopes here her bones to rest. July, in 12 days, year 7228 " . <<For example, when the systematization of Saint George Square was discussed, the "Comrade" declared that the church there, fairly uninteresting (as rebuilt in the 19th century, in a somewhat Neo-Gothical style), had to be demolished. Here was where I intervened, by saying that here Constantin Brâncoveanu is buried. Happily, Ceauşescu reacted so: "Good. 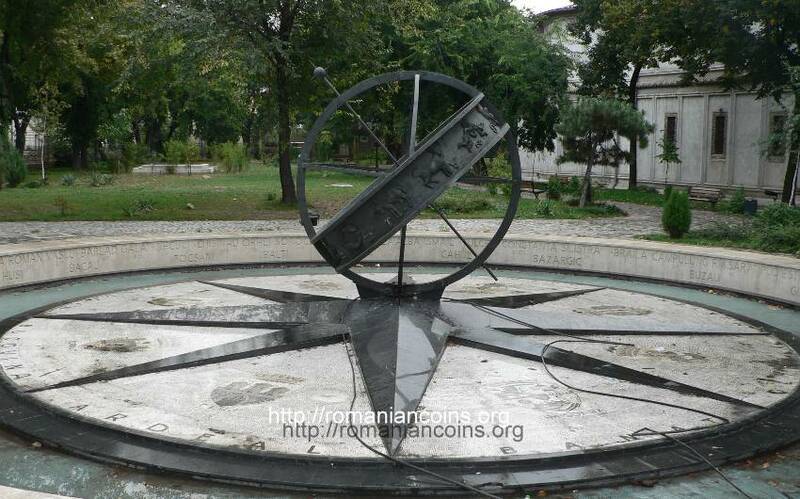 Take measures so that the grave of Brâncoveanu is protected." And so was mentioned in the Chancery Note: "Measures to protect the grave of prince Constantin Brâncoveanu will be taken." This fairly ambiguous formulation was practically used by all the factors with active role, who in unanimity have tacitly decided, also happily, to leave the church alone. Ceauşescu himself never returned to the topic despite the fact that he saw it standing as he was crossing the city." >> [4, pages 181-182]. The restauration of the monument, including its coming back to the initial Brâncovenesc aspect, was also completed during the Ceauşescu era. 2. Dascălu N. (coordinator), Pelerin în Bucureşti, Basilica Printing House, Bucharest, 2013. 3. Desartovici L. S. (coordinator), Doamna Maria Brâncoveanu / Tainica biruinţă a lacrimilor, Holy Brâncoveni Mrtyrs Foundation, Constanţa, 2008. 4. Între istorie şi judecata posterităţii, Alexandru Budişteanu in dialog with Flori Bălănescu, Romanian Academy. National Institute for the Study of Totalitarianism, Bucharest, 2010.